Ziyi recently joined an impressive list of stars to be photographed by Peter Lindbergh for the prestigious Pirelli Calender in 2017. Here’s a behind-the-scenes video. It looks like Ziyi is going to stay a little longer in Toronto this September. The jury for the Platform competition was unveiled today and Ziyi is one of the three jurors. The Toronto International Film Festival® today announced the jury for Platform, the programme that champions directors’ cinema from around the world. For the programme’s second year, its three-person international jury will be composed of legendary directors Brian De Palma and Mahamat-Saleh Haroun and acclaimed actor Zhang Ziyi. Together, they will award a prize of $25,000 to the best Platform selection, to be announced at the Festival Awards Ceremony on September 18. This year’s Toronto Film Festival will be exceptionnally riveting! On September 15th Ziyi will attend the onstage conversation “In Conversation With…” at the TIFF. In Conversation With… offers intimate, in-depth, personal and compelling discussions from cinema’s preeminent talent. You can read here the page dedicated to Ziyi on TIFF’s official website. On August 18th, Ziyi was in Shanghai to attend a press conference for The Wasted Times. She seemed more than happy to join other cast members of the film for this promotional event. 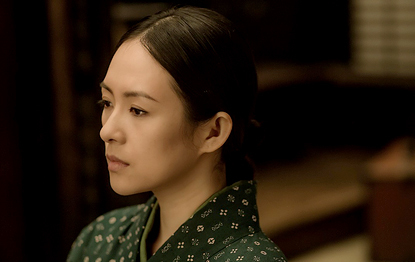 A new still and two gorgeous posters featuring Ziyi were also recently released. The complete lineup of the 41th Toronto Film Festival has just been unveiled. Ziyi’s next anticipated film The Wasted Times will have it’s world premiere at the renowned canadian festival. Let’s hope Ziyi will attend and walk the red carpet. Here is the short sumary offered by the festival’s official site, along with a superb new still. Superstars Ge You, Zhang Ziyi and Tadanobu Asano headline this hotly anticipated thriller about a Japanese spy hunting down a former friend for the murder of his family in 1920s Shanghai.Superstars Ge You, Zhang Ziyi and Tadanobu Asano headline this hotly anticipated thriller about a Japanese spy hunting down a former friend for the murder of his family in 1920s Shanghai. Moreover, the film is slated for release in China on December, 23rd. Zhang Ziyi, the Chinese actress who starred in Crouching Tiger, Hidden Dragon as well as Memoirs of a Geisha, is joining Paramount’s sci-fi thriller God Particle from J.J. Abrams‘ Bad Robot Productions.